Engineering students prepare for 2018 Formula Student action. 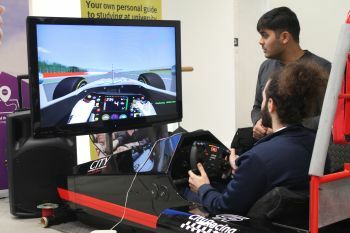 On December 5th 2017, engineering students from the City Racing Team exhibited a racing car and racing simulator in the foyer of the University Building. They also carried out a market research poll as part of the business logic study component of the Formula Student competition. Organised by the Institution of Mechanical Engineers (IMechE), Formula Student is the world's largest student motorsport event. Ross Brawn, Team Principal of the Mercedes AMG Petronas Formula One Team, is Patron of the competition. Each year, the City Racing Team designs and builds a single-seat racing car for the international competition, comprising Mechanical, Aeronautical and Electrical & Electronic Engineering Students. The team is further broken down into three sub-teams: chassis, powertrain, and suspension. The aspiring engineers are challenged to design, build and race a single-seat racing car judged on its speed, acceleration, handling and endurance in trial races to meet all of the competition's requirements. As a research engineer in my Second Year and a powertrain sub-team leader, I’ve been using the communication and leadership skills gained in my degree course and placement. I love being part of Formula Student because it is such a great competition showcasing everything we learn as engineers. We get a great opportunity to compete against teams around the world. The 2018 Formula Student competition will be held from July 11th to 15th 2018.